Relaxed and I used ORS Olive Oil Relaxer - Hairlicious Inc.
the hair is fabulous. love it! Sunshyne your hair looks soooooooooooooooooooo good!!! I mean that trim most definitely held up, you had some really good growth and you ends are on point! Watching that video and looking at the pics your hair is to die for! I was so excited to see the pics and it was worth the wait :) Hair looks FAB! Your hair looks very nice Sunshyne!!! As for AG Products I love their stuff especially their Fast food leave in conditioner....this is what my stylist uses on me when I go get my hair done. Glad you had a good experience. very coincidental I just purchased Ag products today at a salon in Yorkville Toronto.I never read anything online or heard about it before ingredients were right and best of all it their products seem very affordable so far, but thats all i can say for now. Your hair is so nice and healthy!! And, your getting close to your BSL goal. Good luck! Your hair looks wonderful! I, too, switched from Mizani BB to ORS Lye and I'm happy with the switch. 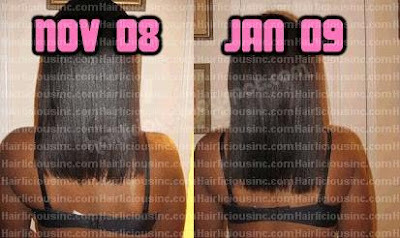 We had the same results and effects from the relaxers. Congrats and congrats! By your next 10 week stretch you'll be back at BSL! Your hair looks great and healthy!! Great progres Sunshyne! Luv, luv, luv the hair! Glad you liked it. ORS didn't burn me either. My hair is recovering from that horrible Mizani relaxer. ORS is wonderful and inexpensive. I love it. GROW girl! your hair looks GREAT! So are you or aren't you going to continue moisturizing and sealing in sections? I must say, that one technique has helped my hair immensely since I first read about it here. Your hair looks great girl! I love your ends, they look so healthy. You'll reach your goal in no time! i loooove this site! btw, could you spend some time talking about the difference between no-lye and lye relaxers? Your hair turned out great!!!! @ Dasia - Thank you Dasia! I'm yearning for BSL. Thanks for the encouragement. @ ErynMyisha - Really? MizaniBB wasn't bad but I felt the urge to switch. I'm *crossing my fingers* for BSL by spring. 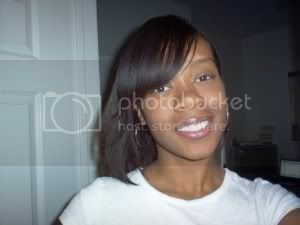 The latest, summer '09. @ Ebony - Thank you Ebony! @ be-you-tifulhair - Aww thanks luv. I honestly appreciate it. @ LaQT - You used Mizani too? Wow. I agree, ORS did not burn my once. @ LHDC - Imma keep growin' ..LOL. Thanks!! @ bapples - Of course. Moisturizing and sealing in sections has been one of the greatest techniques for me. I'm glad it helped you out too. @ Hair gurl - Thank you so much. I think my ends are finally happy. @ DOL - Sure, I'll start a post on that this weekend. @ PJ - Thank you Precious! WOW! You're hair turned out great! And it's growing growing growing!!! Hey sunshyne,your hair looks fab, just a few qs really quick. im thinking of changing my relaxer to Lye instead of No-lye as I heard its better for your hair, preferably Mizani. 1.Does is it really make much of a difference, switching?Did you see a difference from using lye n no-lye? 2.When you used the Mizani & ORS Lyes, did you use the same shampoo or can you use ANY neutralising shampoo? What was your regimen for the mizani one? 3.Can you keep relaxer leftovers in the fridge/cabinet til the next use? Luv your hair. LOVE love LOVE ORS relaxer but I must say that I abhor that little packet of Olive oil conditioner that's suppose to be left on for awhile. I forget what its called but I will never forget that atrocious smell!!! I've never smelled anything like it. lol. I washed it out after like 3 minutes. I couldnt do it. I'll contiue to use ORS but i'll stick to my ApHogee Balancing moisturizer treatment instead of that olive oil pack included with ORS.